SAN FRANCISCO (AP) — Billions of dollars in flood projects have eased fears of levee breaks near California’s capital and some other cities, but state and federal workers are joining farmers with tractors in round-the-clock battles this week to stave off any chain-reaction failure of rural levees protecting farms and farm towns. As the wet winter forces operators of dams to send more water roaring downstream, the struggle to spot and shore up weak spots in nearly 1,600 miles of levees in the Central Valley is unrelenting, said Rex Osborn, spokesman for emergency operations in San Joaquin County, one of the nation’s main farm and dairy counties. 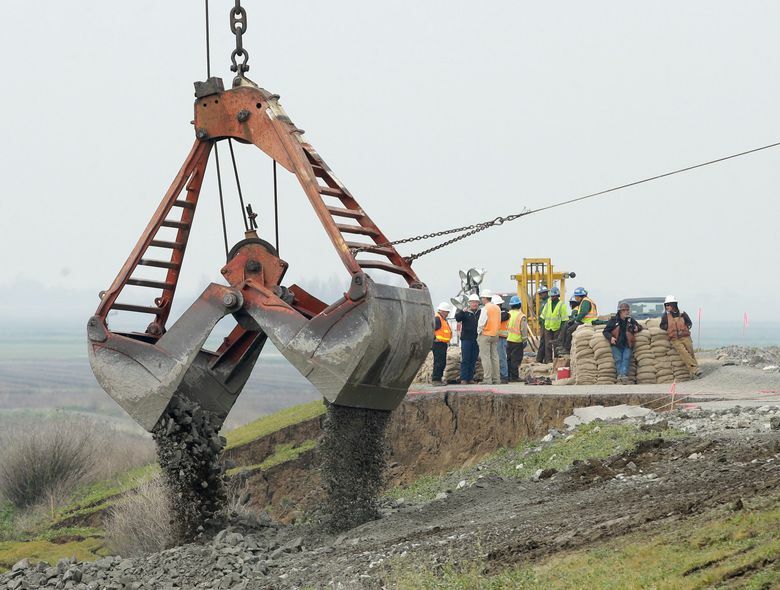 Hundreds of workers with the state conservation corps, engineers, water experts, emergency-management officials and others were scrambling again Thursday to lay down more rock and earth on levees where flood water was threatening to burst through saturated berms. “There’s a flood fight taking place at a dozen different places right now,” Osborn said about the levees in his county. Once the waters ease sometime this summer, California lawmakers will look at releasing $500 million to patch and upgrade the state’s strained flood control system. 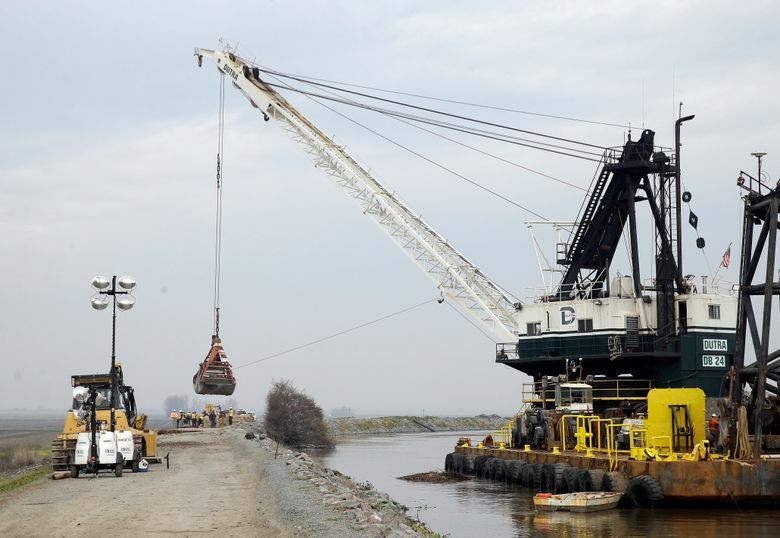 But Jeffrey Mount, a flood-control expert and senior fellow at the Public Policy Institute of California think tank, and other experts say Central Valley levees alone need billions of dollars in work. Gov. Jerry Brown on Friday asked state lawmakers to quickly approve $387 million to speed up flood control projects in the Central Valley, using money from a water bond approved by voters in 2014. He said the state has nearly $50 billion in unmet needs for flood-management infrastructure. Northern California has received more than twice the normal amount of rain and snow this winter, breaking five years of drought. Full rivers and water surging from dam spillways are pouring water into the Central Valley, a 450-mile-long depression running north and south through the heart of California. The region absorbs runoff from coastal mountains and the Sierra Nevada. Winter rains used to turn the Central Valley into an inland sea hundreds of miles wide each rainy season. The capital, Sacramento, flooded regularly, forcing one governor, Leland Stanford, to row a boat to his 1862 inauguration, according to state lore. As recently as 1997, Central Valley levee breaks flooded hundreds of square miles and caused billions of dollars in property damage. Nine people died in floods that winter. Massive spending since then, including a $5 billion bond issue approved by state voters, has strengthened the system of levees, wetlands and weirs that protect the nearly 500,000 residents of Sacramento, along with the people in most of the smaller vulnerable cities elsewhere in the Central Valley. So far, thanks partly to California’s flood-control efforts and partly to the luck of breaks between storms, experts said, the Central Valley has been spared from major levee breaks this time around. Flooding that forced thousands from San Jose this week came from an overfull reservoir that caused a creek to top its banks, not from a levee break. In rural areas, farmers and others who own and primarily benefit from the levees are expected to maintain them and be the first responders when trouble strikes. Fewer than half of the 1,600 miles of Central Valley levees qualify for repairs through the U.S. Army Corps of Engineers, whose standards limit, for example, any trees along riverside levees. 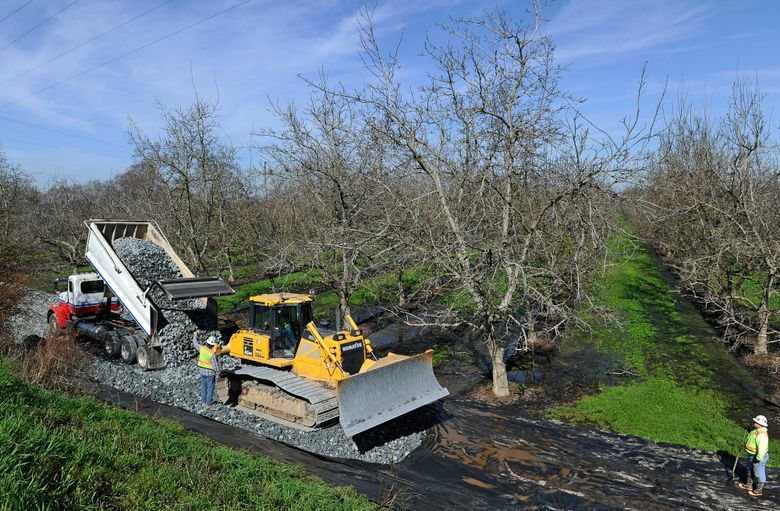 Along the San Joaquin River, farmers rolled out in tractors and other heavy equipment, working through the night, earlier this week when they noticed a 30-foot break in a levee after a filling dam upstream had to release more water, alfalfa grower Tom Coit said. The emergency work that farmers and federal and state workers are doing on the rural levees now is saving their own fields and cattle while preventing the single levee break that could set off a chain of breaks, threatening farm towns downstream, said Osborn, the San Joaquin County emergency spokesman. It’s a fight that farmers and public employees will be fighting until mid-summer, when the runoff from Sierra Nevada snow eases, said Mount, the water expert. That’s when California should start another round in its fight for the levees, Mount said — $20 billion in long-needed maintenance and improvements statewide, including preparing for the stronger flows that are coming more often as the climate changes. “When we wake up, and the waters have passed through…we’re going to see a very tired, damaged, levee system,” Mount said. AP writer Sophia Bollag in Sacramento contributed.